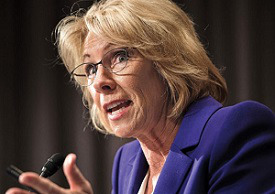 More than $2.8 million in supplemental funding has been designated for low-income schools in North Carolina and South Carolina that were affected by Hurricane Florence, U.S. Secretary of Education Betsy DeVos said in a press release issued this week. About $2 million in funding will go to students in financial need in North Carolina, while about $800,000 will go to schools in South Carolina, according to the press release. The funds are from the Federal Supplemental Educational Opportunity Grant, which uses funds that were not used by other institutions. East Carolina University in North Carolina received a little more than $330,000, the most of any school in the state. A total of 38 schools across the two states received funding.